Or listen at the bottom of this page. It is the end of the 19th century. Like thousands of others, the Rudkus family has emigrated from Lithuania to America in search of a better life. As they settle into the Packingtown neighborhood of Chicago, they find their dreams are unlikely to be realized. In fact, just the opposite is quite likely to occur. Jurgis, the main character of the novel, has brought his father Antanas, his fiancée Ona, her stepmother Teta Elzbieta, Teta Elzbieta’s brother Jonas and her six children, and Ona’s cousin Marija Berczynskas along. The family, naïve to the ways of Chicago, quickly falls prey to con men and makes a series of bad decisions that lead them into wretched poverty and terrible living conditions. All are forced to find jobs in dismal working conditions for their very survival. Jurgis, broken and discouraged, eventually finds solace in the American Socialist movement. This novel was written during a period in American history when “Trusts” were formed by multiple corporations to establish monopolies that stifled competition and fixed prices. Unthinkable working conditions and unfair business practices were the norm. 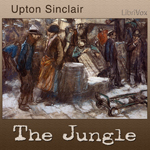 The Jungle’s author, Upton Sinclair, was an ardent Socialist of the time. Sinclair was commissioned by the “Appeal To Reason”, a Socialist journal of the period, to write a fictional expose on the working conditions of the immigrant laborers in the meat packing industry in Chicago. Going undercover, Sinclair spent seven weeks inside the meatpacking plants gathering details for his novel. The Reader wishes to gratefully acknowledge the assistance, and patience, of Professor Giedrius Subacius (University of Illinois) and the folks at Lituanus (www.lituanus.org) for their invaluable support as I struggled with Lithuanian pronunciations. Truly, this audio book would have been far more difficult, and far less authentic, without their help.